The almost 18,000 square foot Victoria's Secret (and Pink) store at West Edmonton Mall enjoy sales second only to those of the company's Manhattan flagship. In 2013, sales at the West Edmonton Mall Victoria's Secret are estimated to have totalled at about $22 million. This was Canada's first Victoria's Secret store location and it opened in August, 2010. The store is located on the main level of the mall's 'Phase III'. We have provided a mall map below for reference. The highest selling Victoria's Secret store in the world is located on Manhattan's Herald Square, neighbouring Macy's. This Victoria's Secret store is about 60,000 square feet. Canada's largest (and the world's second-largest) Victoria's Secret store opened in August in Downtown Vancouver. The 35,000 square foot store appears to enjoy brisk sales, but we're not yet sure about sales targets for that store. Sales at many West Edmonton Mall stores are surging, and several stores are either top sellers in their respective chains or close to it. We'll be doing a separate article on West Edmonton Mall's phenomenal sales growth in the near future. "Edmonton", "Pink", "Victoria's Secret", "West Edmonton Mall"
West Edmonton Mall will become home to Canada's 4th DKNY store. 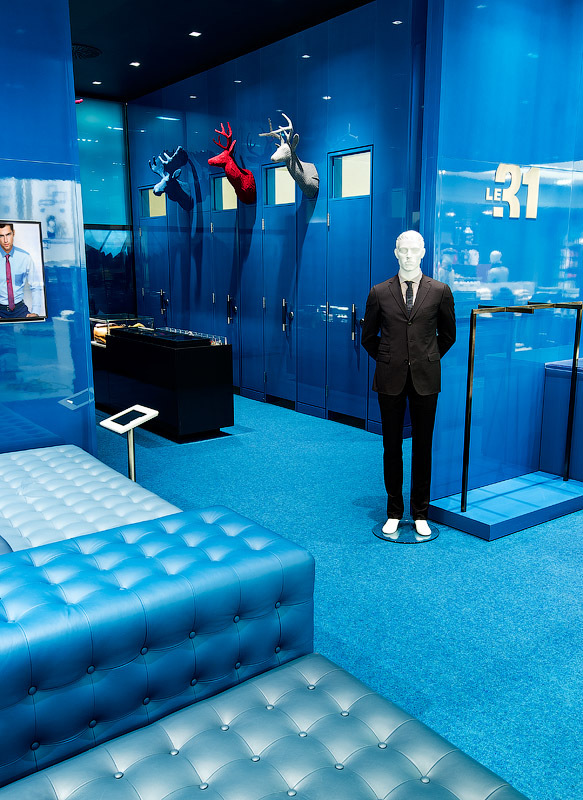 It will be located on the mall's second level between Lacoste and Coach. There are two DKNY stores in Vancouver (2625 Granville Street and at Oakridge Centre) and a store location at Les Cours Mont-Royal in downtown Montreal. A DKNY outlet store is also located at Vaughan Mills in suburban Toronto. For those unfamiliar, DKNY is a lower-priced 'diffusion line' fashion line by New York City-based designer Donna Karan. It was founded in 1989 and includes ready-to-wear and accessories for men, women and children. DKNY is the latest upscale retailer to be featured alongside recently opened Tiffany & Co. and Stuart Weitzman stores. Neighbouring upscale retailers include Michael Kors and Coach. Thank you to our source Darrell Bateman for providing this article tip, as well as the photo at the top of this article. "DKNY", "Edmonton", "West Edmonton Mall"
Sources tell us that the 3,200 square foot Lululemon store at West Edmonton Mall has sales of approximately $26 million, making it the highest selling store in the company. It also makes it one of the most productive retail spaces in North America with sales of about $8,125 per square foot/year. The store is on the mall's second level, steps east of its skating rink called 'The Ice Palace'. Lululemon currently enjoys some of North America's most productive retail space. Sales average US$1,936 per square foot/year, behind Tiffany & Co. at $3,017 a square foot per year and Apple Stores at $6,050 per square foot. It has been an interesting year for Lululemon, which lost approximately $67 million this year due to the Luon sheer pant recall. CEO Christine Day subsequently announced she would be stepping down, founder Chip Wilson came under fire for comments blaming the sheerness of the pants on the size of women wearing them, and the company is still receiving complaints over the Second Chance pants that were made to replace the original Luon pants. Last week, Chip Wilson resigned from his position as Chairman. "Edmonton", "West Edmonton Mall", "lululemon"
Canada's second Microsoft Store opens tomorrow at West Edmonton Mall. It's located on the mall's first level near the Ice Palace, as per the mall map below. The store is about 7,500 square feet. Canada's first Microsoft Store opened in November 2012 at Toronto's Yorkdale Shopping Centre. The Yorkdale Microsoft Store is 6,844 square feet according to the mall's lease plans. For those unfamiliar, Microsoft Stores sell the brand's computers, computer software and consumer electronics. It has been compared to Apple Stores, which have been wildly successful at selling and servicing its various Apple products. There are currently 35 Microsoft Stores in the United States and one in Canada. Its first American stores opened in October 2009. Microsoft stores employ 'Technical Advisors' to assist customers with questions and various issues. These might be compared to the 'Geniuses' at Apple Stores. Microsoft Stores also include 'Specialists' (or trainers) who show customers how to get the most out of their software. Our source for this information is partly from this article. West Edmonton Mall has been securing many exciting new retailers. Two of its most recently announced additions have included jeweller Tiffany & Co. and the first non-Quebec location for the 118,000 square foot fashion retailer La Maison Simons. "Edmonton", "Microsoft Store", "West Edmonton Mall"
Tiffany & Co. opens today at West Edmonton Mall. The 3,300 square foot store is the 12th Tiffany store location in Canada, and its first in Edmonton. Tiffany announced this store location in March. The store is located on the second level of the mall's "Phase III", between Coach and a new Stuart Weitzman shoe store which will also open soon. We first mentioned Tiffany's arrival at West Edmonton Mall last February when we got word that the mall's owner is spending a fortune to renovate the property. The store replaces a small Tiffany & Co. 'corner' which was located within Downtown Edmonton's Holt Renfrew store. It closed in January of this year. Tiffany & Co.'s other Canadian locations are in Metro Toronto (3 locations), Vancouver (3 locations), Calgary (2 locations), Montreal (2 locations) and Ottawa. Along with its multi-million-dollar renovation, West Edmonton Mall has seen several recent retail announcements. There are also rumours that the mall could possibly open Nordstrom and Saks Fifth Avenue stores, though this is still currently speculation. The photo above was taken by Darrell Bateman. He's also known as user 'darrellinyvr Flickr. He's done some excellent Canadian retail photography. To check out more of his photos, click here. "Edmonton", "Tiffany and Company", "West Edmonton Mall"
Footwear retailer Stuart Weitzman will open a 1,500 square foot store at West Edmonton Mall before the 2013/2014 holiday season. Weitzman is the latest upscale tenant to open in the mall. It will be the 10th Stuart Weitzman store in Canada. The Stuart Weitzman store replaces footwear retailer SoftMoc on the second level of the mall's 'Phase III'. It will be located next to a new Tiffany & Co. (which we recently announced will open in the mall). West Edmonton Mall is also undergoing interior renovations that will see it become more upscale. For those unfamiliar, Stuart Weitzman is an upscale American shoe designer/retailer which sells at Canadian retailers including Holt Renfrew and Browns Shoes. It also has nine Canadian stores: Four in Toronto, two in Montreal, two in Vancouver, and one in Calgary. Store locations can be found here. Thank you to our source Katie Dadswell for providing the tip and photo for this article. "Edmonton", "Stuart Weitzman", "West Edmonton Mall"
Saks Fifth Avenue could open at West Edmonton Mall. The mall is actively courting upscale retailers and it is reported that Saks could be next. We previously reported that West Edmonton Mall could get a Saks store, though possibly not within its Hudson's Bay department store. West Edmonton Mall's Hudson's Bay is only about 164,000 square feet, and a full-sized Saks would ideally be in the 75,000-130,000 square foot range. We're not yet sure if Saks will open smaller boutiques within existing Hudson's Bay stores. The Globe & Mail reports that West Edmonton Mall president David Ghermezian intends to approach Hudson's Bay Company CEO Richard Baker about opening Saks in the mall. Ghermezian has successfully secured other upscale tenants for West Edmonton Mall, including Hugo Boss, Tiffany & Co. and a 118,000 square foot La Maison Simons store. He is also spending over $100 million to upgrade the mall. West Edmonton Mall is a family owned shopping centre. It therefore may have the flexibility to make deals with retailers that others malls might not. Ghermezian made concessions to open La Maison Simons and we're told that Simons is doing gangbusters sales. Given the flexibility and previous efforts to secure tenants like Simons, we might see similar efforts put forth for Saks. The Globe & Mail reports that West Edmonton Mall now achieves sales of about $745 per square foot, up from $450 five years ago. Ghermezian expects sales of $1,000 per square foot within the next few years. Given these numbers and the efforts of its owners, West Edmonton Mall could see new and exciting retailers including Saks Fifth Avenue and possibly Nordstrom. "Edmonton", "Maison Simons", "Saks Fifth Avenue", "West Edmonton Mall"
Canada's second Microsoft Store will open at West Edmonton Mall. It will be located on the mall's first level near the Ice Palace, as per the mall map below. The store will be about 7,500 square feet. Tiffany & Co. will open an approximately 3,300 square foot store in West Edmonton Mall. The full-line store replaces a former Tiffany & Co. "corner" located in Edmonton's Downtown Holt Renfrew store. We recently reported on Tiffany's Holt Renfrew Edmonton closing. The store will be located on the second-level in the mall's "Phase III" between store Coach and SoftMoc, across the hall from J.Crew and Banana Republic (see mall map above). We first made mention of a potential West Edmonton Mall Tiffany store in February 2013. This will be Tiffany's 12th Canadian store, and its first first full-line Edmonton store. Tiffany & Co.'s other Canadian locations are in Metro Toronto (3 locations), Vancouver (3 locations), Calgary (2 locations), Montreal (2 locations) and Ottawa. "Edmonton", "Holt Renfrew", "Tiffany and Company", "West Edmonton Mall"
Canada can be proud that Chain Store Age's 'International Store of the Year' is, this year, a Canadian retailer. Last week we reported the award went to La Maison Simons, West Edmonton Mall. This week we're posting some photos of the in-store art installation we mentioned last week. Philip Beesley's 'Simons Aurora' was unveiled Wednesday, February 20th, to much acclaim. We think it looks great, and we're posting some of the artwork's description from Canadian Architect Magazine. The photos we are posting are taken from West Edmonton Mall's Facebook page. According to Canadian Architect Magazine, "Simons Aurora is a canopy of crystalline columns that uses sensory mechanisms to respond to human movement, creating a gently swelling and rippling ocean of light". Inspired by the aurora borealis, Simons Aurora is composed of laser-cut acrylic, mylar and custom glassware. Suspended from the ceiling of the store’s north atrium, the installation is 68 feet long, 26 feet wide, and has more than 40 electronically active columns of varying lengths. Philip Beesley’s team used a new generation of electronics that allows a highly complex, intelligent digital fabric to create responsive chain reactions of light. The installation of Simons Aurora will take eight members of Philip Beesley’s studio and a large team of local artists, designers and students 17 days to complete. The process will be captured on time-lapse video. While Philip Beesley’s works reside in many countries around the world, Simons Aurora is Beesley’s first permanent installation in Canada". [Direct Link to Canadian Architect Article]. Peter Simons, CEO of the store, was in attendance for the art installation's unveiling. From this description in the Edmonton Journal, fun was had by those in attendance. We'll be checking out Edmonton's La Maison Simons this summer when we visit. We also look forward to seeing some of West Edmonton Mall's updates we recently reported on. "Maison Simons", "West Edmonton Mall"
West Edmonton Mall's La Maison Simons department store has won Chain Store Age's prestigious 'International Store of the Year' Award. Simons opened its Edmonton store October 2012 as we previously reported. The store was designed by Toronto-based figure3 and will be profiled in Chain Store Age's March issue along with other category winners. Simons also tied with two American stores for 'best fitting room' design. And pictures of Simons' fitting rooms from our previous post show why: These fitting rooms are VERY cool (as is the image of the men's dressing rooms below and women's, top of this article). Simons spends considerable sums making its store interiors beautiful, interesting and innovative. The retailer also integrates art into its stores, differentiating it from almost all Canadian retailers (and is possibly inspired by America's Neiman Marcus, which includes an extensive in-store art collection). "We continuously challenge ourselves to build stores that go beyond the norm. We want to inspire and delight our customers, not only with our fashion, but with the surroundings, making the Simons experience unique and memorable," says Simons CEO Peter Simons in this press release. During a telephone interview, West Edmonton Mall Leasing Agent Oren Rubin expressed his pride and gratitude for having Simons as a mall tenant, stating that he believes Simons deserves this award. We completely agree. Today (Wednesday, March 20th) Simons West Edmonton Mall will unveil a permanent art installation called 'Simons Aurora' by Canadian artist and architect Philip Beesley. It will be a canopy of "crystalline columns that uses sensory mechanisms to respond to human movement, creating a gently swelling and rippling ocean of light" according to a recent press release. We'll locate some images and provide them when available.